New research from NewVoiceMedia shows that U.S. companies are losing $62 billion a year because of bad customer service. 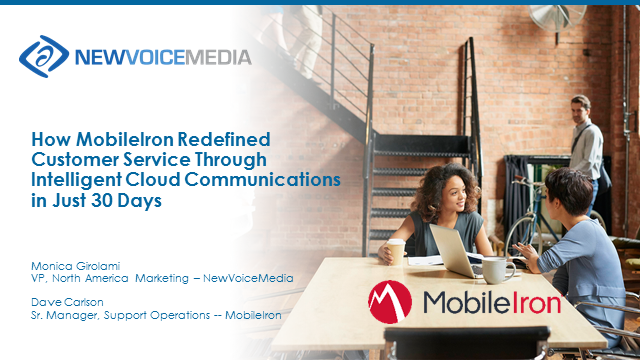 Learn how customers are responding, and how MobileIron has changed its customer journey to increase retention rates. Agent engagement is one of the toughest challenges for contact center leaders. Low engagement contributes to high turnover and poor quality service. Yet year after year, employee engagement levels remain the same. Join Jeff Toister, author of The Service Culture Handbook and NewVoiceMedia, to explore the essential link between agent engagement and empowerment. This interactive webinar draws examples from leading organizations and provides cutting-edge research to bring you three steps you can implement immediately. By integrating your phone system with your Salesforce CRM, your service organization can dramatically improve customer care. You will be able to route incoming service calls to the right agent and help your agents resolve problems more quickly by providing them with information about the caller. During this webinar you will see a live demonstration of NewVoiceMedia ContactWorld for Service and learn how Salesforce and NewVoiceMedia can help you improve fist contact resolution rates and drive down handle times. Workforce management (WFM) is fast becoming an essential part of any businesses technology ecosystem. Particularly those needing to meet the demands of increasing workloads without increased budgets. In this webinar, NewVoiceMedia and Monet Software will share how you can get the most out of automating your staffing to ensure you always have the right people on at the right times. It will provide advice on key considerations for your service delivery and give you actionable insights to start implementing today. It will also guide you through how best to balance the cost vs. service dilemma, ensuring you get the most out of your team without over stretching them or compromising service levels. You'll also meet Nick Johnson, and learn how Sparefoot improved their call center operations and increased service levels with NewVoiceMedia and Monet Software. We'll identify the next steps on your WFM journey, highlighting where you can make considerable improvements across your contact center and elevate service levels to improve your customers’ experience. What’s the best way to enhance the sales and customer experience? Not quite sure what the answer is – don’t worry, every company finds themselves dwelling on how to accomplish this. Join Kelly Ann Jourdain, Manager Technical Support at Global DMS and Carl Rio, Strategic Account Manager at NewVoiceMedia as they discuss how Global DMS tackled transforming their customer and sales engagement by increasing their speed of call resolution, eliminating their back-up call center, utilizing omni-channel and analytics to drive efficiency gains. Join Kate Leggett, VP Principal Analyst at Forrester and Becky Levy, Associate Director of Member Services & Development Operations at WGBH as they discuss tips to transform the customer experience, how to create a profitable customer service strategy, and what technologies to utilize when increasing business and customer value. •The pains of an antiquated, disjointed contact center strategy. •Vision for a modern customer service experience. •How they successfully led the evaluation and four-day implementation of NewVoiceMedia. •Their transformation results and lessons learned along the way. A lively Q&A will follow this presentation with Kate and Becky – come ready with your questions! While many businesses today have visionary goals to deliver customer service that “dazzles” their customers, many are struggling to simply satisfy their customers growing list of needs. Why? Much of the challenge is due to the fact that customer’s basic communication requirements have changed from even 5 years ago. Customers not only expect fast service through multiple channels (SMS, email, phone and social), they also expect the first representative to handle their request will have background on their case and the proper training on how to solve their inquiry. Simple enough? Well, not really. Improving agent productivity is one of the primary ways to drive an increase in overall call center performance. Higher agent performance leads directly to increased customer satisfaction, better retention and better referrals. But how exactly to go about motivating and incentivizing agents in a call center environment? One way is to use advanced gamification techniques to uncover the habits of your top performing service agents. This path to success can then be replicated across your entire team using a combination intelligent coaching prompts that guide agents and game mechanics that keep them engaged. At NewVoiceMedia, we not only provide a gamification application called Motivate, we also use Motivate to optimize the performance of our own service teams. During this webinar you will hear directly from Kev Willers, SVP Customer Service at NewVoiceMedia, as he explains how we’ve used Motivate to improve service levels. Kev will be joined by Peter Grant, SVP, Motivate who will explain how to successfully deploy game mechanics in a Salesforce call center environment. Many large organizations are skilled at measuring and optimizing wide variety of Key Performance Indicators (KPIs) designed to make sure their call centers are providing excellent customer service. But for smaller businesses that may be just ramping up service and support teams, the job of selecting which KPIs to focus on and then determining the appropriate level of performance for each is often confusing. Questions like “how do I create an SLA?” "what is an acceptable wait time?” or “what is an acceptable dropped call percentage?” are often asked. In this webinar hosted by NewVoiceMedia, you will learn the answers to those questions and many more. Join Art Schoeller, Principal Analyst at Forrester Research on Wednesday, December 16th at 8am PST to find out what small businesses can learn from larger call centers about establishing and measuring performance metrics. This insightful webcast focuses on how businesses can enable their service teams to deliver positive customer experiences every time. John discusses both the strategy and technology mix every customer service team should consider. Mr. Goodman, the author of Strategic Customer Service and Customer Experience 3.0: High-Profit Strategies in the Age of Techno Service shares his findings behind the "Customer Experience 3.0", including 10 technologies to make staff and customers successful in a way your CFO and CMO will love. Do customers expect even small businesses to provide a 1-800 number for support? The answer is a resounding “yes,” but it can be hard to find a cost-effective system that just works and is easy to train your staff on. Phone support doesn’t have be daunting. Get tips from the experts on finding the perfect telephony solution for your business. Join Desk.com, NewVoiceMedia, and Customer Service Lab as we decode buzz-worthy terms like screen pop, call recording, click-to-dial, softphone and many more. After this webinar you’ll be able to identify different types of telephony partners, find tools that will help your agents make calls from their desktop, analyze the impact of the phone channel and deliver an enterprise call center experience for your small business. Plus we will have Q/A running throughout the event, so please come with your questions and social engagement tips! Please note: All registrations will be shared with Salesforce, ClickSoftware and NewVoiceMedia. Come hear industry experts discuss the convergence of customer engagement centers and field service and how this can get you ahead of the competition. Customer service expectations have changed. Your customers are multi-channel, connected 24/7 and expect you to be too. Customers expect a consistent, seamless experience from intelligent contact center interaction to agile field service delivery. If these standards aren’t met, consumers are quick to flee to a competitor. Moderated by Forrester Research, join Salesforce, NewVoiceMedia and ClickSoftware to discover how an integrated customer service solution can help you gain greater visibility through all stages of your service cycle. Learn how world-class service companies are empowering their service teams with the right data, immediately accessed from anywhere in their service chain, to deliver a contextual and personalized service to their customers. In this 30-minute webcast, you’re invited to hear directly from WGBH how its Member Service organization transformed their antiquated telephony solution and customer engagement strategy, delivering drastic improvements for its members and agents. -The business value of a customer engagement strategy that integrates with your CRM infrastructure. -Q&A – come ready with your questions! Whether you know very little about NewVoiceMedia or are considering a new customer engagement strategy for your own business, this is a rare opportunity to learn directly from a peer in the industry. Join Rick DeLisi, Senior Director CEB and co-author of the The Effortless Experience as he provides an overview on their latest research which shows that customer effort in service interactions is the strongest determinant of customer loyalty—96% of customers who put forth “high effort” are more disloyal. Instead of struggling to delight customers beyond their expectations, consider focusing on creating service strategies that make it easy for the customer through low-effort experiences!